Beautifully restored circa 1960’s 3 piece living room set consisting of 2 lounge chairswith a matching couch, design attributed to Adrian Pearsall for Craft Associates. This gondola style set, one chair with a classic Pearsall soaring backrest, has been completely restored. 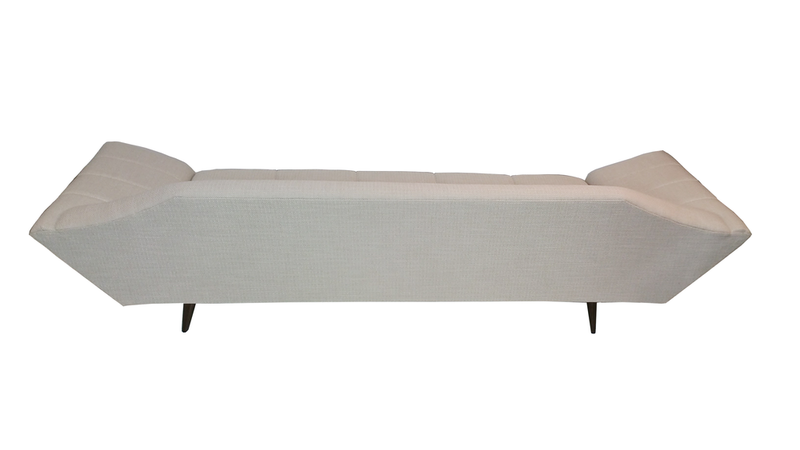 The dark walnut legs and trim are refinished and the set has been re-upholstered in a creamy woolen acrylic blend fabric with a subtle checkered pattern. The couch measures 104” wide x 32” deep x 27” high at the top of the backrest. Each chair measures 48” wide x 32” deep, the one matching the couch is 27” high at the top of the backrest, the other backrest is 40” high.